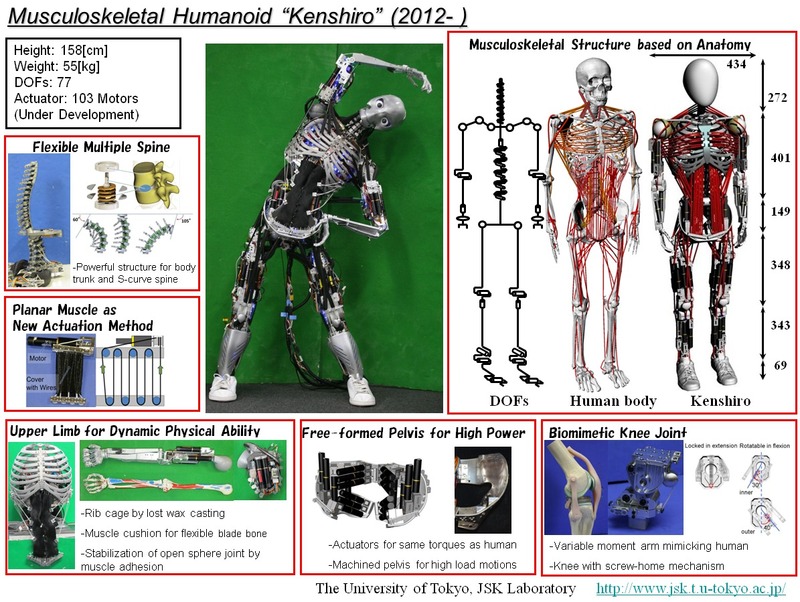 Yuto Nakanishi and colleagues at the University of Tokyo‘s JSK Laboratory have unveiled Kenshiro, a full-sized humanoid robot built with bones, ligaments, and pulley-style muscles modeled closely after human anatomy. The robot features 160 actuators: 50 in the legs, 76 in the trunk, 12 in the shoulder, and 22 in the neck. Weight, torque, and joint speeds are all as close as they could get to human, though the joints are quite a bit on the slow side; we don’t yet have actuators that can match the size, speed, and weight of real muscle. But Kenshiro gets about as close as it is possible to get with current technology. See Kenshiro (sometimes in parts) demonstrating its moves in the video below. Other humanoid robots often have problems with weight distribution and balance. Looking for inspiration in our own bodies, which have been finely tuned by millions of years of evolution, certainly makes sense to me.